A few weeks ago, we went on a trip to Missouri. Instead of flying, we decided to drive the entire way. I really enjoy long road trips, and I remember my family driving all over the place during summer vacations. Before we moved to Phoenix, we drove from Richmond Virginia to the Outer Banks of North Carolina, or to Washington DC, Maryland, Virginia Beach... We drove up to New York City a few months before the 9/11 attacks. We drove to Missouri. Whenever we were bored, we'd get into the car and drive. That strangely ended when we moved to Phoenix. There just isn't anything within a few hours drive from here. We could drive to San Diego but we'd rather fly. There's Flagstaff about 90 minutes north, Tucson about 90 minutes east. But neither of those cities holds much interest, when compared to the days when we could drive for 2 hours to spend the day at the Smithsonian, or exploring Dupont Circle, or enjoying the cherry blossoms near the Jefferson Memorial. Anyway, back to our trip to Missouri. I had worked a night shift the night before we were to leave, and then instead of getting out of town by 8a, between packing and a last minute trip to Target for an iPhone car charger, and then realizing right after we left that we didn't have a copy of our car registration in the glove compartment, we didn't leave until 1130am. So I wasn't all that helpful driving on the way to Missouri, only driving about 4 hours over a 23-hour trip. But it was an adventure. We planned to stop whenever we got down to a half-talk of gas, and we'd then fill up the car, wipe the bugs off the windshield, and get a bit to eat or drink from the numerous gas/grocery stores along Route 40/44. We passed Flagstaff Arizona, then Albuquerque New Mexico, then Amarillo Texas (where I had planned to sleep a few hours but we were going so good we decided to keep going), then Oklahoma City, and then finally into Missouri. Quite the adventure, and our KIa Soul did great the whole way. 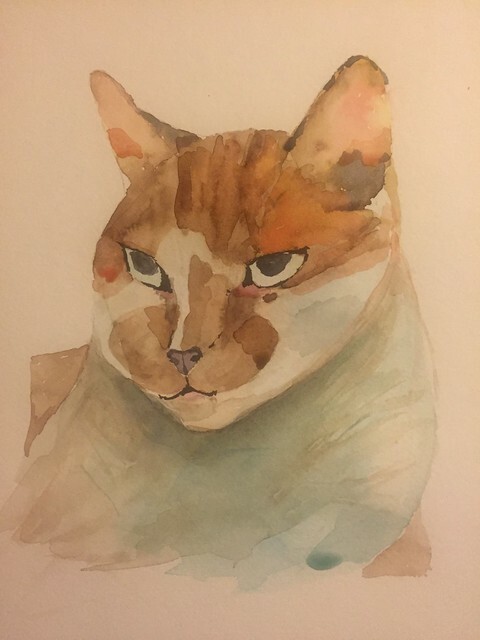 A watercolor of one of our kitties, BoyKitty, no longer with us. 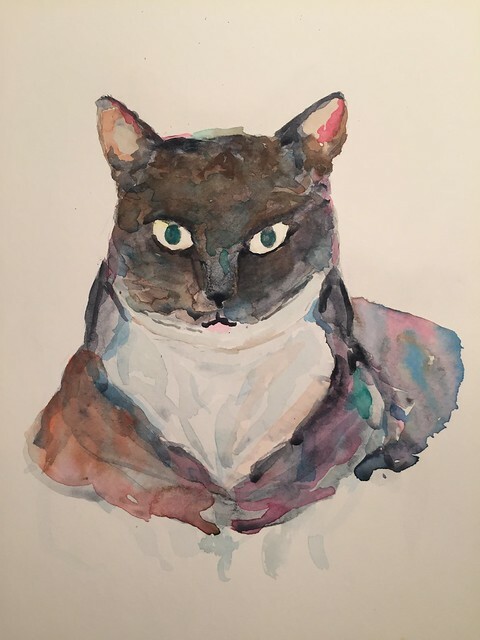 It is frequently said that a good painting always starts out with a good drawing. I never truly believed this, and for the past many years, sort of "winged it" with either no underlying drawing, or a hastily drawn sketch. But since I've switched to a process where I make sure the underlying drawing is appealing, I have been much happier with my watercolors. Yes, sometimes the drawing takes a long time, as my drawing skills are not all that great. I usually look at a photograph pulled up on the computer screen and I tediously draw. Frequent erasing of false lines. Sometimes I'll spend 30 minutes drawing something, then find the thing I was drawing was not properly placed and end up erasing the whole thing. 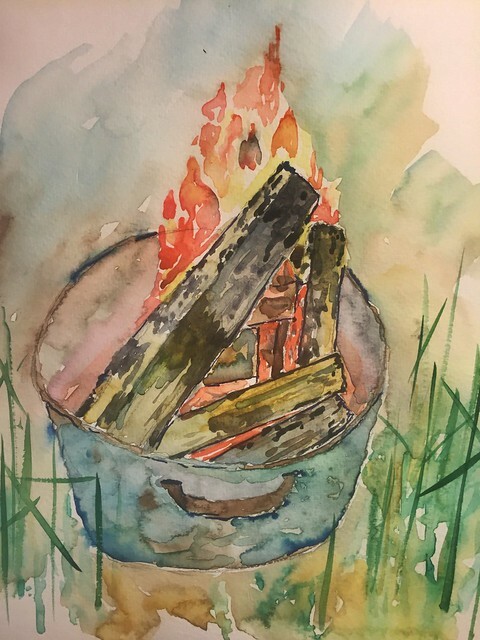 Some artists will draw on a piece of drawing paper, and once they get the drawing the way they like it, they will trace the drawing and transfer to the watercolor paper. They do this in order to prevent damage to the watercolor paper, which can result in resistant sections of paper, or differing textures that react to watercolor differently. But I've been switching to Strathmore Series 500 hot-pressed paper that comes pre-cut to 8 x 10 sheets. I chose these sheets because I seem to prefer this size, and if I ever want to frame some of my artwork (something I have yet to do) you can purchase inexpensive frames including matting. But I've noticed the paper will take the multiple erasing without changing the characteristics of the paper. Also, if I really dislike the painting, I can paint something else on the other side, and I feel like I'm not wasting as much. Work is work. I've finished my three nights this week, and am off until Monday night. We're seeing the new Jason Bourne movie at Studio Movie Grill in Scottsdale. Yes I know, again, it's been a long time. Since the last time, I've completed my Bachelor's in Nursing degree. It wasn't as bad as I had assumed it would be. Despite my cynicism, I am indeed proud of the fact that i finished it. I still maintain that the most useful (on a day-to-day basis) skills I've learned have more to do with using Word, Excel, Powerpoint and other tools more effectively and creatively. But on a nursing level, I did learn a lot about how to utilize all of the "evidence-based practice" buzzwords that nurses get all excited about these days. Now that I'm an alumnus, I have (supposedly) lifetime access to the CINAHL database of peer-reviewed articles, and that availability has proven to be very useful. I'm also resuscitating my blog to keep my blogging skills up to date. I've been challenged to utilize my familiarity with tools like blogging and podcasting to try to come up with more innovative and modern ways to keep nurses informed about their clinical challenges, and to help us come up with more effective tools to promote collaboration. I am lucky to have many remarkably intelligent folks on my staff, many of whom are very well acquainted to tools that are only now entering the nursing environment. So I wanted to get back into the groove of keeping up my blog, to keep current on what folks are doing to maintain an effective online presence. There are so few personal bloggers out there (where i used to read dozens of personal blogs, only one or two continue to update their blogs on a regular basis). I just wonder what folks are doing to replace the creative outlet that blogging provided. I can't believe we've all come down to 140 word Tweets and Facebook. OK, back to the Democratic Convention. I watched the Republican Convention last week, and I still have nightmares and can't seem to get all the way clean no matter how many showers I take, it was that disgusting and disturbing. Listening to Michelle Obama last night gives me hope that there are real people out there that aren't just masses of conflicting impulses. I wish they could take her speech and turn it into a warm smooth salve that I can apply to the bumps and ridges of my brain. She makes me feel that good.